I wish I had a diary of the prediction season over the 30 years I have been in the investment business that included the results at the end of each year. In fact, I attempted to find relevant research and was quite entertained by what I found on the interwebs. One guy even wrote “the market will go up this year IF history repeats itself” - and he was serious. 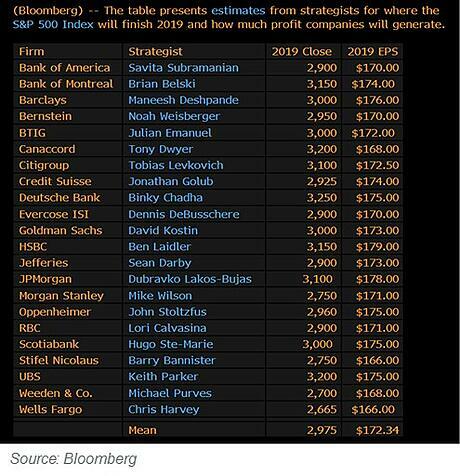 I did find a summary of top analyst predictions for the S&P 500 at the end of 2019 on Bloomberg, including earnings per share estimates. You will notice a pretty tight range around the mean, and not one analyst really ventured out to make a bold bet. I wonder why? Perhaps it’s herd behavior or group think. They all share the same data and read the same reports. Regardless, there is little value in the guestimates when what really moves markets are the cognitive and emotional biases of investors day by day. Let us say for argument sake, you agree with the Deutsche Bank prognostication and you adjust your portfolio to track with that bullish stance. This analyst may be exactly correct on the end point for the S&P for 2019, but the ride from here to there may be very volatile. Will you be able to stay with the strategy in the face of volatile markets such as has occurred over the last 90 days? That is where human behavior becomes a challenge and why market predictions are generally useless even when correct. My partners and I have studied many different forms of behavioral bias (prospect theory, endowment effect, loss aversion, confirmation bias, etc.). And there are plenty of articles that review them so I won’t repeat the work. My favorite is confirmation bias, which to me explains why so many analysts are so closely aligned in their predictions. They have already formed their hypothesis, and look for confirmations of those beliefs in each other’s analysis – it is simply an example of groupthink! But do predictions really matter? As an investor, what happens in the US large cap market in any given year should not have a significant impact on long-term financial goals if the overall portfolio is properly structured and risk managed. If you are an advisor, you should be focused on constructing portfolios that provide your clients the highest probability of achieving their financial goals, with a risk profile consistent with the ability of an advisor AND investor to stick with a strategy during volatile times. At Blueprint, we refer to this as behaviorally sound portfolio management. Investing is all about staying with the journey so you can arrive at the desired destination. Do you really care if someone predicts the fastest way to nowhere if it has no bearing on your investment success?